Niche line Bond no. 9 has launched Bond No. 9 Dubai Encore. The three new fragrances, Citrine, Amber and Amethyst, follow last year's Ruby, Indigo and Emerald. Bond No. 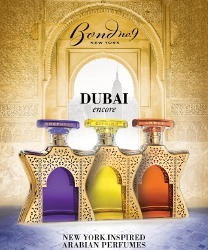 9 Dubai Citrine, Amber and Amethyst are $550 each for 100 ml Eau de Parfum. Those bottles are so beautiful, and those prices are so ridiculous. But I guess if they’re actually marketing them to Dubai, money is no object. My pulse is non-quickening,looking at these….